Names were withheld in writing this story to protect the integrity of cats and the embarrassment of the owner. And said owner find five may not be the final step. 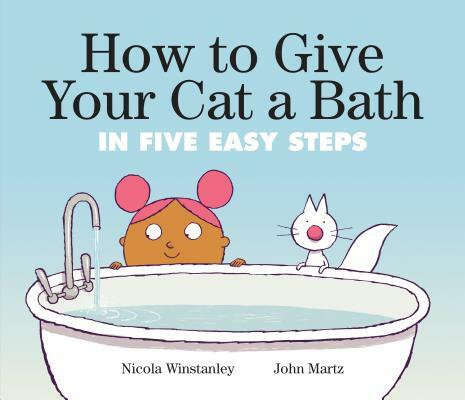 In this hilarious and clever "how-to," a little girl and a know-it-all narrator are thwarted by a cat who refuses to take a bath. The perfect read-aloud for fans of Snappsy the Alligator and Interrupting Chicken. Seems simple, right? One problem: the cat has no intention of doing ANY of these things! Watch as the steps keep changing, the cat keeps escaping, the girl keeps eating cookies and the mess keeps escalating. Soon it's not just the cat who needs a bath--it's the whole house! This spoof on an instruction manual features an increasingly bewildered human, a nonchalant cat and a know-it-all narrator . . . who really doesn't know it all. How DO you give a cat a bath? Read on to find out! NICOLA WINSTANLEY has always believed in the power of stories to bring comfort. She is the author of The Pirate's Bed, A Bedtime Yarn and Cinnamon Baby, which won an honor prize for the Ezra Jack Keats New Writer Award and was shortlisted for the Marilyn Baillie Picture Book Award. Nicola lives in Hamilton, Ontario, with her family and one dog. No cats. JOHN MARTZ is an illustrator, cartoonist and designer. He is the author and illustrator of Burt's Way Home, A Cat Named Tim and Other Stories and Destination X, and the illustrator of Flyary and Who's On First. His work can also been seen in The Nib. John is the art director for Penguin Random House Canada Young Readers, and he lives in Toronto with his wife and one dog. No cats.